I’m a little past 38 weeks, which means this baby thing can happen any day. It’s a funny thing to try to compartmentalize that today you may be just you, and tomorrow – a parent. I’ve always been a what they call a “preparer” and doing things well in advance, but this time, I’m told, it’s coupled with a strong nesting instinct. To be honest, I haven’t felt a stronger instinct to nest; I’ve always liked nesting, always liked organizing my home, always liked to keep a well-stocked pantry. Right now it’s more involved but mostly because I feel that it needs to be. And as much as I still want to squirrel every single meal I make, I’ve hit that point where the freezer can’t take on another thing without something else coming out. If freezers were elastic, which sadly they’re not, then maaaaybe, I could squeeze in another soup or stew, but where things stand now, the meals are prepped and portioned out. I’m told I’ll be absolutely famished in the days post delivery, and Andrew has been warned that if I try to take his bowl of bolognese away, he is to give it to me without so much as a protest. I’ve also been readying to bribe the nurses. I made a stout ginger cake, the one that’s a staple here around wintertime, and froze most of it. But I couldn’t stop myself from eating a slice – okay, two slices – with a cup of tea, and so it’s more like six eights of a loaf give or take. I hope the nurses understand: It’s my favorite cake to eat in the winter. And I’ve started to make in a loaf pan instead of a bundt for easier disengagement as well as better transport. I can just take the whole loaf, wrap it in some wax paper, tie it around, and off it goes in my tote. So much easier than a bundt version which requires a plate and some balancing. That last bit I’m not so good at these days given that my center of gravity has shifted some. I also made some brownies, and it’s entirely possible that the nurses’ batch, has a bit of kick to it. I had a few recipes to choose from in the archives and I went with one that, in retrospect, was very good but not stupendous. It’s a recipe that graced many a food blog, but in the end, if I had to be really honest, it’s not my favorite. I think it’s very solid, but I wouldn’t exactly write home about it. I forgot that this is how I felt about these brownies until I made them. Of course, I had to write the wrong, and so, a couple of weeks ago, I went on what Andrew described as a “brownie bender”. In less than three days, I made four batches of my favorite brownie recipe: one for the nurses, one for us, one for my coworkers (after I was Instagram-shamed by a colleague that sharing is caring – she was right of course), and another one for “emergencies”. I’m afraid, however, that we’ve plowed through both “ours” as well as the “emergency” supply, and more brownies are called for. Luckily, these are so quick and easy to make that even in my intense bout of third trimester fatigue, I can muster up the strength to make another batch. I’ve made many different brownie recipes through the years ranging from cakey to fudgy; some with butter and others with olive oil, using various chocolate, spices, and other add-ins. But my favorite ones, hands down, come from Alice Medrich. It’s a recipe from her wonderful book, Bittersweet, and it’s simply called “Best Cocoa Brownies”. While I tend to shy away from recipes that begin with “best”, I can comfortably say that these are my personal favorite and thus the “best” in my world. These cocoa brownies have been written about all over the blogosphere, and I’m not exactly adding anything new here, except that I like mined with a bit of heat to them, so that’s my spin. 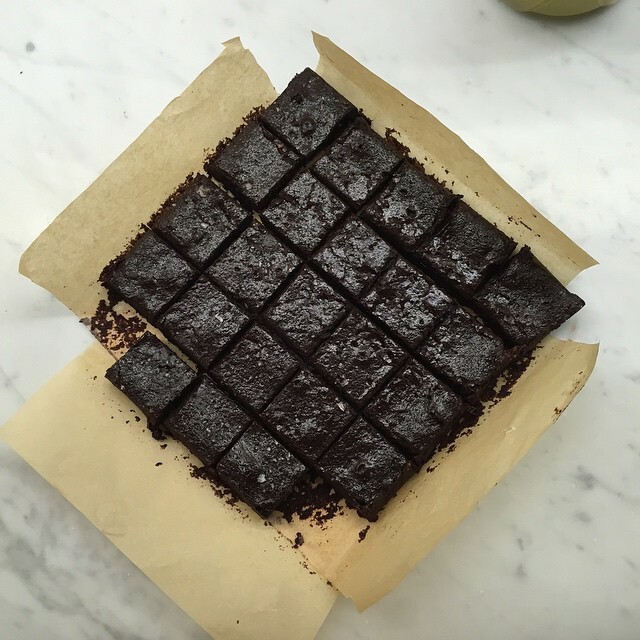 I like Alice’s recipe for many reasons, but perhaps the best one is that it tastes like the fudgiest, most chocolatey brownie we remember from our childhood (you know the one I’m talking about – the one that comes from that famed red box), except it’s a thousand times better. It’s as if everything that a brownie has aspired to be – it has suddenly achieved. Instead of chocolate, it uses unsweetened cocoa powder, and I’ve discovered, unsurprisingly perhaps, that the better the cocoa powder, the tastier the brownie, though if we’re being honest, commonplace unsweetened cocoa is still pretty spectacular here. The batter is so easy to put together, anyone can do it. It takes less than twenty minutes from start to finish, and that’s if you move as a pregnant slug’s (mine) pace. The eggs go in cold, so it’s not like you even need foresight to get them to room temperature. You can throw in a handful of nuts in the batter at the end, if that’s your sort of thing, but I’m firmly in the no-nuts-in-my-brownies-ever camp, and so I skip them. I do, however, get very generous with flaky salt and rain that stuff on top until it looks like I’ve gone too far. It always works out swell and that hit of flaky salt against the deepest, darkest chocolate is just about the most luxuriously delicious thing I’ve tasted. And I’m not even a huge chocolate person. I realize this may be the last post before the baby comes. If not, I’ll hopefully get to tell you soon about potato leek soup (cue the snores of, oh, everyone) that’s become a favorite of ours. While potato leek soup sounds about as thrilling as watching paint dry, I assure you, this one’s a keeper. And like most soups – forgiving, easy to make, and best of all – filling. But for now, I leave you with these brownies – I hope it’s enough. I’ve pretty much kept the recipe as is, because it’s perfect, but added cayenne and smoked paprika for a bit of a kick. I’m generous with flaky sea salt as well, and even when I think I’ve gone a little overboard with it, it always winds up tasting just great. This is to say that you should use a liberal hand with it should you like the salty and sweet combination in general. Some people like their brownies with nuts; I personally do not. If you do add nuts, a generous handful of chopped nuts of your choosing will work out perfectly proportion wise (no need to overthink and measure out here). Finally, a reader emailed me a question about cutting the brownies neatly. I like to chill the brownies first before cutting them. I also like to cut them with a serrated bread knife and wipe the knife in between the cuts. Because these brownies tend to be on the fudgier side, they tend to be a little messier to cut, which can be frustrating after you spent the time making them. The chilling + bread knife + wiping knife between cuts = neat little squares. I sort of eyeball mine and make 4 cuts one way and 4 cuts another way – to get 25 squarish pieces. Hope this helps. 1. Position a rack in the bottom third of the oven; preheat the oven to 325°F (162°C/ Gas Mark 3). Line the bottom and sides of an (8×8-inch) square baking pan with parchment paper, leaving an overhang on two opposite sides. 2.Combine the butter, sugar, cocoa, paprika, cayenne, and salt in a medium heatproof bowl set over a pot with barely simmering water. Stir from time to time until the butter is melted and the mixture is uniform. The mixture should be hot enough that you will want to remove your finger fairly quickly after dipping it in to test. Remove the bowl from the pot and set it aside briefly until the mixture is only warm – not hot. The mixture will be thick and gritty. 3. Stir in the vanilla with a wooden spoon. Add the eggs, one at a time, stirring vigorously after each one. When the batter looks thick, shiny, and well blended, add the flour and stir until you cannot see it any longer. Beat the batter vigorously for 40 strokes with the wooden spoon or a rubber spatula. Spread evenly in the prepared pan and sprinkle the flaky sea salt on top. 4. Bake until a toothpick inserted into the center emerges slightly moist with batter, about 30 to 35 minutes. Transfer to a rack and let cool completely, preferably in the refrigerator, until cold. Lift up the ends of the parchment and transfer the brownies to a cutting board. Cut brownies while cold, using a sharp knife, wiping it between cuts with a barely damp paper towel. Does “2/4 cup plus 2 tablespoons (105 grams) unsweetened cocoa powder (natural or Dutch-process)” mean 1/2 cup plus 2 tablespoons unsweetened cocoa powder? And you really don’t have to worry if your baked goods don’t make it to the hospital. The maternity ward nurses are absolute angels sent from heaven who need no bribing. I guarantee you they will be amazing and you’ll probably want to name your newborn after one of them by the time you leave. 38 weeks?! That’s amazing! All the best to you and Andrew – it must be such an exciting and/or stressful time for you both. On the recipe side of things, I actually wanted to thank you for that stout ginger cake – it looks absolutely scrumptious. Thanks for sharing! Ksenia – we love this cake; it’s a favorite here. The loaf pan makes life a lot easier, though the bundt is visually very arresting. This is my go to brownie recipe too. I add cinnamon and espresso powder to the flour and also sprinkle Maldon salt on top. It’s quite delicious. By the way, I believe you meant this recipe is from Bittersweet not Pure Dessert. Wishing you all the best. Rona – yes, of course, thank you! I have most of Alice’s books and that was a silly mistake. Thanks for pointing out. Prego brain in FULL swing here. I must try the stout ginger cake-it sounds amazing! Wishing you the very best with bebe’s arrival, Olga! Oof, these brownies are so gorgeously dark and fudgey looking. Whether a bribe or just a gift, I’m sure your nurses will adore them. Wishing you all the best for the baby’s smooth and safe arrival. With brownies and treats like these, I am sure you will be well looked after in the hospital! I have been making these for years and they are the best! sonya and mardi – thank you, ladies!! the nurses’ brownies is that other recipe. they’re still good, but they’re no match for alice’s brownies – truly outstanding! arthur – glad you agree! What Molly said! About the nurses! Angels! I just made some Nutella brownies for Valentine’s Day,and they were OK, but not amazeballs. I’m tempted to try these, although getting into brownie baking more than a one-off is dangerous. I just came across your blog today when searching for a new fun recipe to try tonight. I made these brownies and they are amazing! I added 1 tsp of this chai spice blend I just ordered on etsy and it put them over the top! Amy – I guarantee you’ll never look back. These are really the best and are so easy to make! Nutella brownies never quite had me, because i think you need really rich dark chocolate for them to be truly incredible.